This half term we have many exciting events to look forward to such as; East meets west fest, summer trips and sports day!! We will be sad to say goodbye to Talha in July as he will be going to Woodlands! In Literacy we are reading another ORT big book FLOPPY`S BATH and using the Floppy puppet to make him do different actions, for example, chasing the rabbit! In Maths we have been handling money and sorting coins into copper and silver. Whenever possible, it is good to allow pupils to give money for an item in a shop, so that they realise they cannot just help themselves!! We continue to rote count to 10 and practise placing numbers 1-5 in order from memory! Our final topic is “Fun in the sun”! We enjoyed making wraps in cookery- chopping up peppers and putting them inside with the sauce. We also enjoyed looking in a suitcase and finding things to wear and play with in the sunshine! This term the Yr 5/ 6 topic is “Water water everywhere!” We have already tasted different flavoured water, made a water picture collage and used watering cans. We have started creating a music and movement piece related to water, which involves dancing with umbrellas and a splashing/tap dance! The 3 songs we are using are “Raindrops keep falling on my head”, “Singing in the rain” and “In my wellies”. We hope to video our “water dance” and share it with you at the end of term. Our Literacy ORT big book “BY THE STREAM” also relates to the theme of water. We hope to role play parts of the story eg playing “pooh sticks” in class. We hope to find a suitable bridge to drop sticks when we visit Stanborough Lake. In Maths we are listening to rote counting and practising counting verbally through songs and rhymes. We also have finger puppets to help with signing the correct number, showing the correct number of fingers. Some pupils are remembering how to place number cards in order to 5, without matching. We have been using pairs of small shoes to encourage pupils to find 2 objects, as they naturally want to find the matching pair. We are continually seeking ways to motivate pupils to use the computer and ipad purposefully. They enjoy using the touch screen to select a favourite song. More recently we have been using a sounds programme on the ipad to listen to sounds made by animals and transport eg when they touch the sheep picture, it shows a photo of the sheep with the “baaa”! This half term we are continuing to encourage lots of speaking and actions in class. Many pupils are really trying to join in because the sessions are familiar and predictable eg shake hands for the “hello” song, move arms up and down for the “up/down” song etc. They are aware that we want them to make sounds, copy mouth shapes and body movements. We are also practising listening skills in our pre-phonics sessions. Sometimes we play musical instruments behind a screen and encourage pupils to give the photo of the instrument they can hear, before showing them the actual instrument we are playing. We also have video clips of everyday noises that are familiar in class eg water from tap, CD player, music keyboard. Once pupils are recognising these sounds, it is hoped that they will be able to give the photo of the sound. There are useful programmes that we watch on the computer to help match animals to the sounds they make eg listening to “baaaa” before seeing the sheep etc. In Literacy we have been reading STRIPEY HORSE books for the whole of the Spring term. We have a stripey horse soft toy that we use when telling the story. The book “Stripey horse just for you” encourages matching colours and opening coloured boxes containing toys. For the topic about the UK we are concentrating on recognising familiar places and landmarks in Luton and London. We hope to explore locally and use public transport, as well as show awareness of a post box, a taxi, an aeroplane and a bus. We will be posting letters home and learn about stamps and coins which relate to the UK only. We enjoyed the tea party in the first week, waved flags and ate traditional sandwiches and cake. A visit to a fish and chip shop is also planned! This half term we have started swimming at Inspire pool and this will continue until Easter. All pupils have now become familiar with the large pool and it is not too deep, so they can stand in the water. We also continue to have sensory circuits each morning on arrival to school and all pupils are so much more independent at moving from one area to the next-bouncing on trampolines, rolling along mats, balancing on benches and twisting on PE cones. We allow plenty of time to take off and put on socks and shoes independently before and after this session too. In Diamond class we spend a lot of time encouraging pupils to copy actions and simple signs to music and songs. Clapping and wiggling fingers, waving and signing “more” are the ones we are concentrating on at present. These can be encouraged throughout the school day and at home. We have also been using a microphone to encourage any kind of speech sounds, as many of the pupils are not exploring vocalisations to attempt to say “hello” etc. There are various sounds that pupils can be encouraged to copy eg “la la la la”. It is so exciting when we hear pupils try to speak and copy actions and we need to remember that doing things over and over again is the key to success! In Maths, we have a box of tasks that pupils can complete eg inset puzzles, shape sorters, stacking beakers, number cards etc. We also have been using finger puppets to encourage counting, as well as numicon. Pupils often join in with counting activities once you start them off eg “1,2……” This is another useful approach to encourage talking. Finally, colouring can be a calm activity and we are using the primary colours for this - red, blue, green and yellow. Many pupils find it difficult to keep within an outline, but cut out shapes enable them to colour the whole area. They need plenty of experiences of holding a crayon and just colouring back and forth with a continuous movement! So…..there are lots of simple activities that our pupils can enjoy and the more we do them, the more they will be able to do! During the first half term we enjoyed performing our “apple tree” song in the Harvest festival, visiting the Jump Arena and joining in with the Year 5/6 sponsored run. On Thursday afternoons we now go out each week into the local community. So far we have been to the park, the local shop and had a drink in a local café. We hope to continue to also have trips in the minibus, particularly as Christmas gets nearer! This term in the topic about Winter Wildlife, we are watching video clips of animals that we often see at this time of year and matching pictures and symbols of them. In the first week we are looking at hedgehogs and squirrels and making pictures of them. Our new Literacy book is “Walking in the jungle”, which pupils can watch on Youtube at home. We are learning how to match a sound to a picture, so when we hear a snake sound “sssssssss”, we find the snake picture. We are also practising the movement up and down with our pointing finger and hope to use a finger puppet to help identify the right finger! In Maths we have been using bricks to build and count, puzzles and shape sorters to encourage problem solving skills and songs to make counting fun. There are 2 work areas in class set up using the TEACCH approach (Treatment and Education of Autistic and Children with Communication Handicaps). 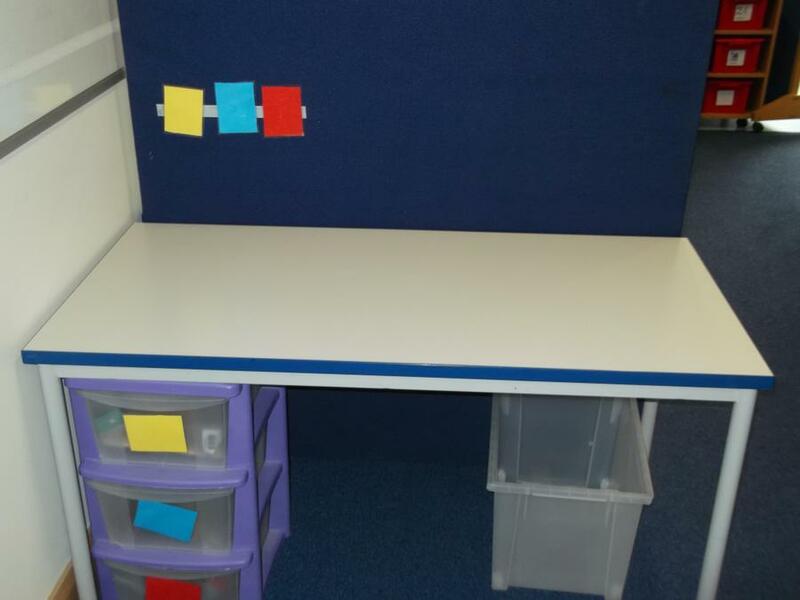 This consists of 3 work trays that contain Maths activities that pupils complete independently. Activities may include a colour sorting activity, an inset puzzle and matching numbers. All pupils have an opportunity to complete 3 tasks that are suitable for them. We continue to enjoy group experiences in Music, cooking, PE and art- working alongside each other, exploring objects, sounds and movements through many different activities. We have had a busy beginning to the Autumn term with settling in to our new classroom and new routines. This term our topic is “Fit as a fiddle” and we have been learning about actions we can copy with different parts of our bodies eg clapping hands, stamping feet etc. We have drawn round our bodies and are placing parts of the body in the correct position eg hand prints at the end of an arm! We have visited Richmond hill East site new play equipment (see photos) and are looking forward to going to JUMP arena and some outside gym equipment before half term. We are also learning to match photos to objects, places and people throughout the day. Many of the pupils in Diamond class enjoy musical activities, so jingles with photos are used before certain sessions take place eg. numtums tune for Maths, Wheels on bus song for Literacy. In writing, we are practising round and round movements both with ribbons in the air and coloured pens on paper (write dance). In computing skills, we have a music keyboard in class that pupils are encouraged to explore, as well as a variety of switch toys. In the ICT suite pupils are encouraged to activate favourite songs by using the touch screen to press the “start” button and to use paint programmes eg Dazzle. In cooking, we are practising using tools in the kitchen, rather than fingers. We have made banana custard by chopping bananas, then stirring and pouring custard into bowls (see photos). Opportunities to use fingers in sand, cornflour, shaving foam etc are given afterwards in class. This term we are specifically encouraging pupils to say “hello” using any form of vocalisation, emphasising the 2 sounds “e-o” and shaking hands with 2 movements. We have a “hello” song which makes this fun! Hopefully all the tunes we use in class become so catchy that you will hear them sung at home one day!